Operation shed 5 stone: Sub 30 5km.......Finally!! Regular readers of this blog or those that follow me on twitter will know that I have been trying to get this sub 30 5km for months, well, 9 months and one day to be exact. When I crossed the line after finishing London Marathon in a not so respectable time of 6 hours and 15 minutes (I should have finished in 5 hours 30 minutes according to my training pace and had I stuck to the plan on race day) I promised myself that this was the end of plodding along and getting the distance in, it was time to do something about my weight and turn into a proper runner. Which is when I started this blog. Well I have started what I set out to and I am halfway there, 34lbs down and 36lbs to go. I have changed my attitude to food, although this is a daily battle and I am enjoying my new outlook on life. I can see my body changing, especially over the last couple of months. My arms, shoulders and neck have slimmed down and my chest is rapidly disappearing, my legs, hips and stomach are slowly shrinking and my bum seems to be shaping up, best of all I now have a waist. I decided that I needed to get used to running at 10kph so this became my normal pace, to do this I decided to use the treadmill to get that consistency so everytime I was in the gym I did a few kms to get on track. I set myself a target by the end of 2012 to get the time but my attempts failed, again, it was in my legs but mentally I struggled. I kept trying into January but 3.5km seemed to be my limit, but I was getting closer. I had offers for pace makers by @Russww (a Warwick local) and @TheIron_Bear (one of my oldest friends) and I was absolutely petrified, mainly as I didn't want to let either of them down, and I was scared of failing again. 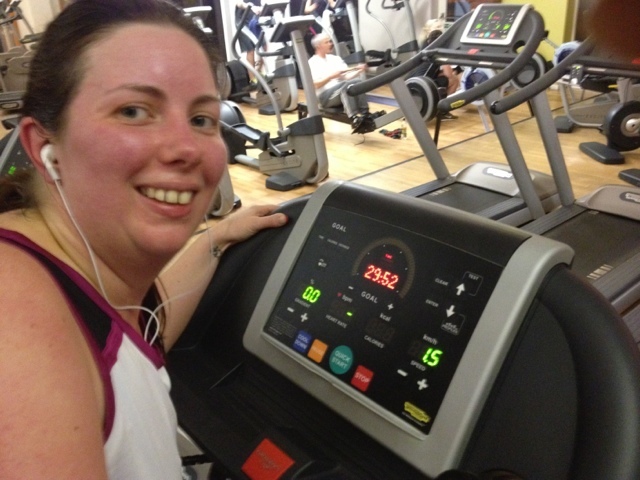 So, I decided to set a target date: 23/1/2013, I was going to run it on the treadmill and @TheIron_Bear was going to run next to me. The run itself went better than expected. I got halfway and was told to knock the speed up to 10.5kph but the advice was ignored, I was feeling ok but I knew that 3-4kms were going to be hard, this is usually where I give up so I wanted it out of the way, my plan was to get to 4km and then start knocking the speed up and that was what I wanted to stick to. With 800m to go I started to knock up the speed, I wasn't aware of the time but knew that I had to make up around 30 meters so I had left it a bit late. As soon as I hit 5km I checked the time: 29:52, I had just scraped it and I was ecstatic, such an amazing feeling that I now could officially call myself a proper runner! I could draw a line in the sand now from playing at it and actually doing it, and I now have that benchmark and know what I need to do to improve it. This is me hanging onto the treadmill for dear life after finishing! !